Weather Adventures offers a unique opportunity to experience severe weather up close and learn about thunderstorms and how we predict and chase them with our Storm Chasing Tours. You’ll be led by experienced and knowledgeable tour guides as we follow weather patterns moving across Tornado Alley (and sometimes further) during the spring storm season. Our team combines backgrounds of meteorology and photography with more than 8 years of experience safely leading people to storms. Weather Adventures Storm Chasing Tours originate out of Oklahoma City in April and May, moving to Denver in June as the season progresses and the weather patterns migrate north. Typically our early season tours take place on the Central and Southern Plains, sometimes extending into Dixie Alley. In years past, we’ve chased storms with our feet in the Atlantic Ocean and on barrier islands near the southern tip of Texas. 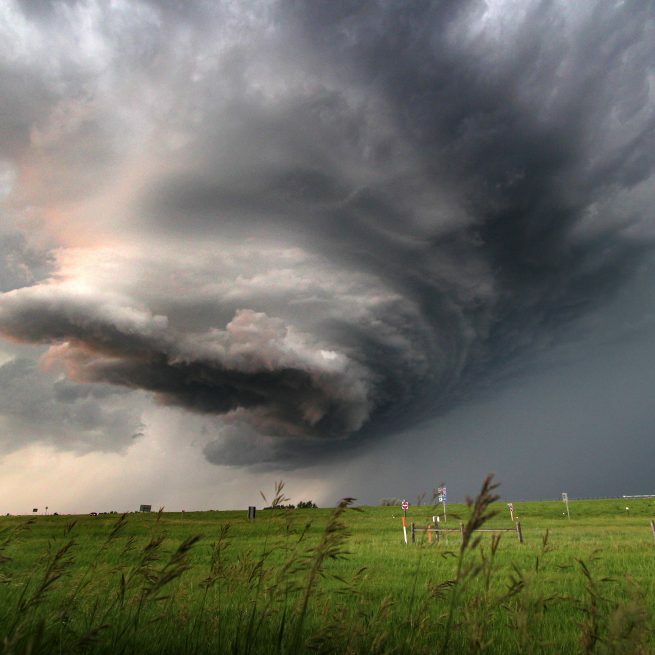 In late spring the storms typically begin moving into the High Plains and as far as the Northern Prairies of the Dakotas and against the Rocky Mountains. We have chased on the eastern edges of Glacier National Park in Montana and into the woodlands of Minnesota. We’ll be keeping all of our chase tours within the Continental United States, so passports won’t be needed for our American guests. During your tour, the only set destination will be the base hotel, where we’ll stay the night of your arrival and the night before your departure. In between, we’ll travel wherever the wind takes us. Literally. This “traveling without a destination” adds to the sense of exploration and adventure, and captures the feeling of freedom so attached to classic romantic notions of the American West. A typical chase can range anywhere from 3,000 – 5,000 miles. Simply put, the most amazing weather on Earth. Nowhere else on the planet are conditions more favorable for supercell thunderstorms than in Tornado Alley. The combination of ample moisture from the Gulf of Mexico and cool air blowing off the Rockies provides the perfect breeding ground for explosive storms. Location isn’t everything, though – it takes the knowledge and experience of seasoned chasers to be in the right place at the right time. Our team will guide you as we encounter a variety of breathtaking storm structure, beautiful lightning displays, intense hailstorms, and the highlight of any tour, tornadoes. Weather is known for being unpredictable, but that can be an asset as much as a challenge. Imagine the thrill of experiencing a dry microburst with 90mph wind gusts atop rock formations in western Nebraska or intercepting incredible dust devils on foot as they swirl across the Colorado grasslands. You might even get lucky enough to witness the Aurora Borealis on a starry night along the Montana-Wyoming border. What are the chase vehicles? Our storm chasing vehicles for the tours are 15-passenger Chevrolet Express 3500 vans. We have found over the years that passenger vans provide the space and sturdiness required to handle the thousands of miles and intense weather conditions we experience each season. In each van we will have two guides in the front seats – a driver and a navigator, and up to six passengers. This allows adequate space with 2 passengers per row, and enables each of our guests to have a window view. Our air-conditioned vans feature Wi-Fi, so each guest will be able to connect at least one personal device to the internet at a time. Additional power inverters in each row will ensure your devices can be fully charged when weather strikes. Our chase computer is outfitted with the latest radar, mapping and video-streaming software to give us the tools we need to be on the right storms and to them with the world. We also have SiriusXM Satellite Radio, so no matter how far away from civilization we might be, we’ll always have good music. In the back we’ll have a cooler stocked with complimentary bottled water and room for your own favorite drinks. Space in the vans does come at a premium, so we ask that you limit your bags to one piece of luggage and one carry-on sized bag (like a backpack, laptop or camera bag). What’s a typical tour like? Several weeks prior to your arrival date you’ll receive an email detailing the hotel where we’ll be staying on the first and last nights of your tour. This base hotel will always provide a complimentary shuttle to bring you to and from the airport. Several days prior to your arrival date you’ll receive an email that will determine a time and location (usually the hotel lobby between 6-7pm) to meet your guides and fellow guests. We recommend getting flights earlier in the day to allow you extra time for delays and and to attend this meeting. At the specified time on your arrival date, we’ll conduct this briefing, introducing our team, reviewing the rules and laying the groundwork for what to expect over the next 7-10 days of your tour. After the briefing we’ll go out together for dinner at a nearby restaurant and get to know each other and answer any questions you might have. Before calling it a night, we’ll determine a meeting time for our morning departure. In the mornings, we’ll provide a briefing of the day’s plans and weather. We’ll usually make a stop straight away to fuel the van, refill the cooler and allow guests to pick up snacks and coffee for the road. If a chase is expected that day, we will travel to our projected target area. Our lunch plans will be determined by where we are and how much time we have. Some days we’ll have time for sit-down lunches, while on busier days we might be limited to fast food or grab & go items from gas stations on the rarest occasions. Once we reach our target area, we’ll refine our forecast using satellite imagery, detailed weather models, and observed conditions. Once storms begin to take shape, we’ll switch into chase mode and the tempo will pick up. This means food stops and restroom opportunities will be limited. We’ll position ourselves for the best opportunity to safely view the storm and follow along with it. Our ability to spend time out of the vehicle watching the storms depends on many variables including road network, proximity to storm, weather conditions, chaser convergence and more. While outside the vehicle, our guides will spend time describing the scene you’re seeing, pointing out storm features and explaining how they come together to form supercells and tornadoes. We’ll chase for as long as conditions allow. Usually we’ll have enough time for a sit-down dinner, but again sometimes location and time limit our options to something quicker. None of the hotels in the middle of your tour are pre-planned – we travel wherever the wind blows us – so we’ll determine where we stay each evening, deciding our best option based on what we expect for the next day. Before turning in for the night, we’ll set a meeting time for the next morning. This process will repeat for the duration of your tour. On your final chase day, our range will be limited by the necessity to return to the base hotel that night, but if there are storms we’ll give chase. We’ll have one final dinner together and then say our goodbyes. On your departure date, the hotel will provide a shuttle to the airport. What if there are no storms? Chasing storms is always our number one priority, so if they are within reach we’ll always chase them. However, there will probably be down days over the course of a tour. Luckily, America’s pretty big and there are lots of amazing places out there to explore and experience. Our favorite choice for down days is visiting National Parks – over the years we’ve been to Yellowstone, Glacier, Rocky Mountain, Mt. Rushmore, Wind Cave and Badlands. Many times there are also state parks, wildlife preserves, and recreation areas to explore, some of which allow for up close encounters with wildlife. We’ll go to museums, like the Twister Museum in Wakita, OK and the UFO Museum in Roswell, NM. Sometimes we’ll get the chance to take a guided tour of the National Weather Center headquarters in Norman, OK. We’ve raced beach buggies, had mini-golf tournaments, gone caving and taken boat rides. We promise to do our best to make every day of your tour fun and memorable, regardless of the weather. All entrance fees, tickets, etc. for these attractions will be paid by Weather Adventures and are included in the cost of your tour. We know it costs a lot for a tour, so we strive to provide you with the best possible experience. Included in the cost of your tour are between 5 and 11 days of adventures with 6 to 12 nights, respectively, of accommodations in reputable hotels, travel from the airport to the base hotel (and back again), the costs of operating and maintaining our tour vehicles, proper operating licenses and FULL INSURANCE COVERAGE, complimentary Wi-Fi and bottled water in the van, entrance fees to any attractions or activities on down days, and the expertise of our veteran guides. Each guest will also receive a Weather Adventures t-shirt and post card set. Not included are travel expenses from your home to the base city (and back again), snacks and meals, souvenirs, and other personal incidentals. I had an absolute blast whether we were chasing storms or just hanging out. I can’t recommend these guys highly enough!. When I signed up for a tour with Dave and Blake, I expected to chase storms – but it was so much more than just a chase! I often tell people my week with them was the best week of my life, and I mean it! Once you go storm chasing with these guys you’ll be hooked forever. After chasing with Blake and Dave for several years, all I can say is that if you’re interested in weather or just want to have a great time on vacation, Weather Adventures will be the right tour company for you!